I got some great news today! An email from our immigration lawyer saying Vermont USCIS had finally processed our immigration paperwork for the removal of my husband's conditional status. It took them 5 months to process everything. (Which was better than the estimate of 8 months to 1 year we were given because they were backlogged). 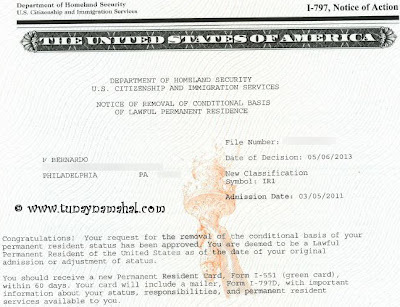 Below are some key blog posts documenting our entire immigration process up until now. (If you want to see all the posts you can click here: Immigration Process). Our immigration process started back in 2008. We started doing research the year before we were married because we knew we would have to save money for the fee's. 12-19-2009: F.B. & I were married in the Philippines. After we were married I came back to the USA so we could start our immigration process. 06-01-2010: Now we're getting somewhere! 10-14-2010: NVC: Step 4 of 6. 01-19-2011: Yikes! Just 2 weeks until.... (F.B. 's Visa Interview in Manila, Philippines). 03-06-2012: 1 Year in the USA! 10-10-2012: Hubby's birthday & getting immigration started again. 12-01-2012: Thanksgiving and Immigration... (Removing conditional status from F.B. 's resident card). NOTE: Our lawyers Peter J. Gonzales & Shanna Stanton have changed firms. They are no longer with Kahiga Tiagha. They are now with Green and Spiegel LLC, and still located in Philadelphia.